Director Justin P. Lange’s decision to make his first feature film about a hideously ferocious, preternaturally powerful, flesh eating monster that would eventually win the sympathy and empathy of audiences despite its hellacious savagery with an ax, resulted in one of the best horror movies in recent memory. The challenge for this reviewer, hubris in check, who believes he has divined facets of THE DARK overlooked and misunderstood by other reviewers, is not to load up his review with spoilers, other than say that, perhaps, readers might consider ignoring references to undead or zombie. THE DARK, instead, is a fairytale wrapped inside a boldacious horror movie. It is, on one level, a hideous-thing-that-goes-bump-in-the-night thriller of uncanny panache and, on another level, a fairytale with incredible verve. Writer-Director Lange accomplishes so much in his cinematic story telling that I doubt that any cinephiles will be satisfied just seeing this horror story once. I’ve seen it twice already. There were several times during my first 94-minute screening I wanted to savor what I had just seen but couldn’t because of other scenes equally arresting. The cast is rich with supporting and minor characters who all appear to have been meticulously selected for their roles and scenes. Lange’s monster is played by Nadia Alexander, who won the prize for Best Actress in an U.S. Narrative Feature Film for BLAME at Tribeca in 2017. She’s back to Tribeca in another bravura role as Mina, a fiendish, female creature possessed by an incendiary rage as all consuming as napalm. Lange, nevertheless, does not depend on gratuitous gore and hideous makeup for the horrors and terrors occurring in THE DARK. In an interview, Lange told this reviewer that LET THE RIGHT ONE IN, a Swedish romantic horror movie, was an inspiration for his first feature film. 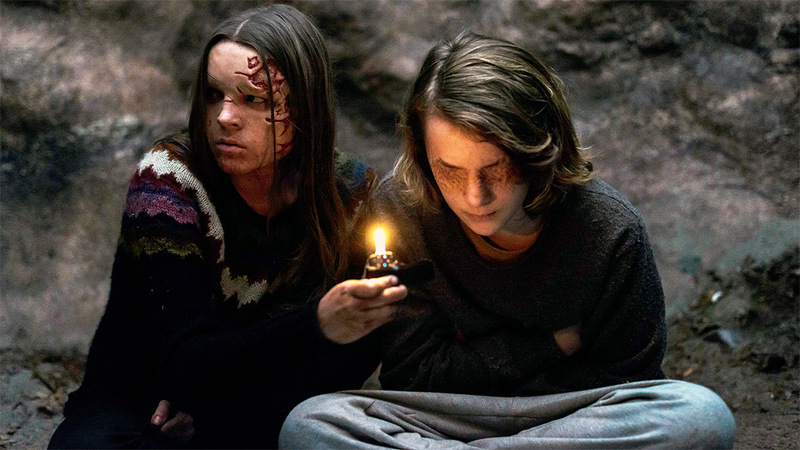 The “right one” is Eli, played by Lina Leandersson, a “beautiful but peculiar girl,” peculiar as in blood sucking vampire who makes friends with a bullied boy whom she decides not to drain. I liked LET THE RIGHT ONE IN. What Lange accomplished, however, was impressive, a monster, whose face alone could scare the bejesus out of Michael Myers, Jason and Leather Face, eliciting sympathy and empathy from audiences. It’s how Lange accomplished that and so much more in this movie that audiences will feel the need to revisit and revisit. How many other filmmakers will take that kind of challenge? Hint: When Mina inadvertently stumbles upon Alex, a traumatized youth, inexplicable things begin to happen.